We’re all pretty much the same. That’s one thing I’ve learned from studying the past. Yesterday I had pictures taken by photographer Kate Singh of Aevum Images. I had my hair and makeup done professionally before the session. A camera does different things to your normal face that makeup can correct. I wanted to look my best. So did the Chrisman sisters in Nebraska in the late 1880s. Two of the sisters were old enough to make homestead claims. When they posed for the photographer, they wore their best clothes. They wanted their horses in the photo too. The Chrisman sisters posing for the photographer over a century ago. They posed in front of their house. 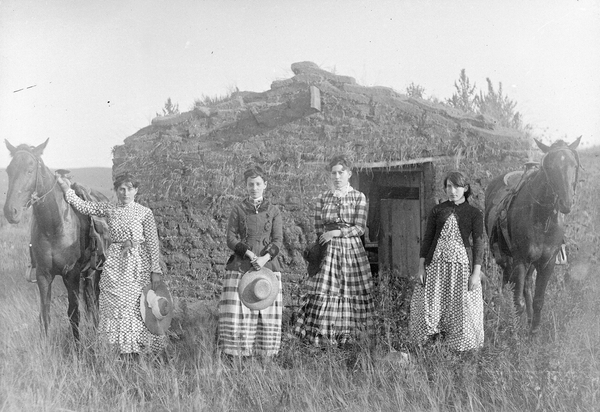 No, it’s not what we’d call great, but a sod house on the plains was what you lived in at that time. Don’t forget it wasn’t a man-owned house. This was owned by a woman. And as we frequently do, no matter how great we look, we wish the camera would show something else. I’ll look at my photos and I’ll wish I looked more…something. But I’ll remember Ruth Chrisman. She doesn’t look like a horse thief to me.